Our clients contacted Build Professional to discuss the possibilities of remodelling and extending their current home in October 2014. With two young children and another baby on the way our clients required a larger home. Build Professional built a great relationship based on listening to our client’s needs and understanding how they wanted to live as a growing family. The brief was that they required a large, extra living space and one that created a separate living zone away from the current kitchen / dining and family room. With a baby on the way they also required a 4th bedroom. Another aspect to the extension was that our clients wanted to use this opportunity to change and modernise the façade of the home. During these early discussions we also ascertained our client’s budget. The Build Professional team came up with a design concept following the brief and meeting the desired budget. Our clients were excited with the prospect of knowing that their requirements were fulfilled and that they were future proofing their home for their family. The design solutions that the Build Professional team established for the home were to firstly reconfigure existing spaces for better flow and functionality and this entailed remodelling the existing living room into a 4th bedroom and creating a stairwell off the current entry. The stairwell would lead to the upper floor extension that would become the large separate living space. The design of the upper floor extension had many benefits for our client’s family as it would change the front façade of the home, the extension would not encroach on their current backyard and outdoor entertaining areas and the new living space would now capture the northerly aspect and amazing views that were offered to the home. The upper floor extension was well designed with the addition of double glazed magnum framed windows allowing energy efficiency and great cross flow ventilation, a space that will be comfortable all year round. The windows not only maximise the views, northern aspect and natural light but were also strategically placed to capture the greenery from the magnificent tree on the southern side of the home. The Ash timber staircase, glass and stainless steel balustrade and window leading up to the living room has added a design feature to the current entrance creating a great sense of warmth, light and space. The façade of the home was modernised yet mimicked some components of the original home. Mini orb was already used on the current exterior so we continued with this material in a darker colour that matched the new gutter and flashings. The home was rendered and painted to complete the makeover. The complexities with this project was obviously ensuring and maintaining a safe and secure site for our clients and their young children to live in. Access to the work site and upper floor was difficult while maintaining safe access to the front door and car access to the driveway and garage. We were able to make clever use of scaffold to allow access and protect the gardens at the same time. Protection zones were set up to form ways of access to the scaffold and upper floor in and around the gardens. Construction began on 27th April and was completed on 22nd July 2015, less than 13 weeks and this was a result of a well organised and careful planning approach that helped the construction team to execute on time and on budget as expected. This home remodel and extension has delighted our clients and enhanced their lifestyle. We completed the project before their baby arrived and now they can fully enjoy life with their young family and home complete. The addition of the new living room is a functional, beautiful, light and relaxing space to enjoy offering a completely separate living zone. The addition of the fourth bedroom has added great value and future proofed their home. 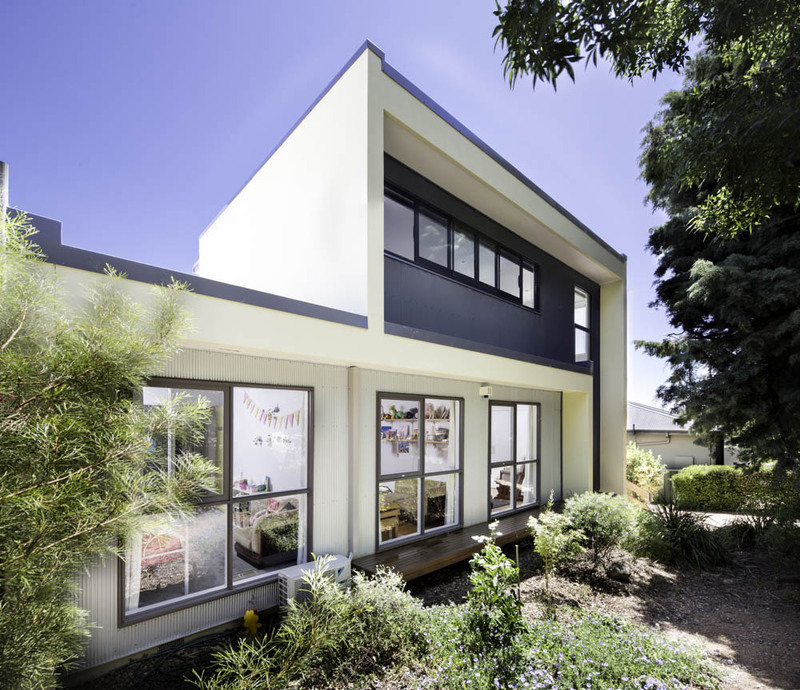 The exterior of the home now looks fresh and modern with crisp lines whilst boasting a lovely street presence. The upper floor extension looks seamless in design; it is as if it was always part of the home and not just an afterthought that was added to the centre of the roof. The Build Professional team had an amazing and positive experience with our clients and we were thrilled to play a part in completing such a fantastic home for such a lovely young family and we consider them great friends of the Build Professional team.